The 10 sen coin was one of the initial coins minted under the new monetary system. The 10 sen continued until all denominations below 1 yen were made obsolete under the current monetary system. The first design (for 1870) featured both the dragon and rising sun, similar across all denominations. 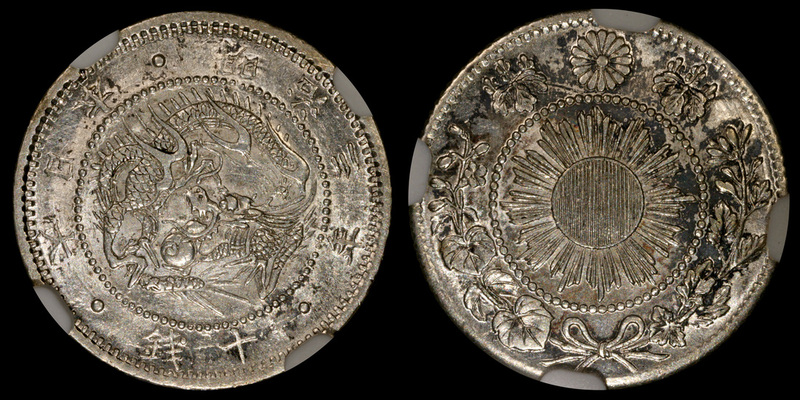 None were minted dated 1872 (M5), and by 1873 the rising sun was abandoned in favor of a denomination design. The next design shift dropped the dragon in favor of a rising sun/denomination combination. 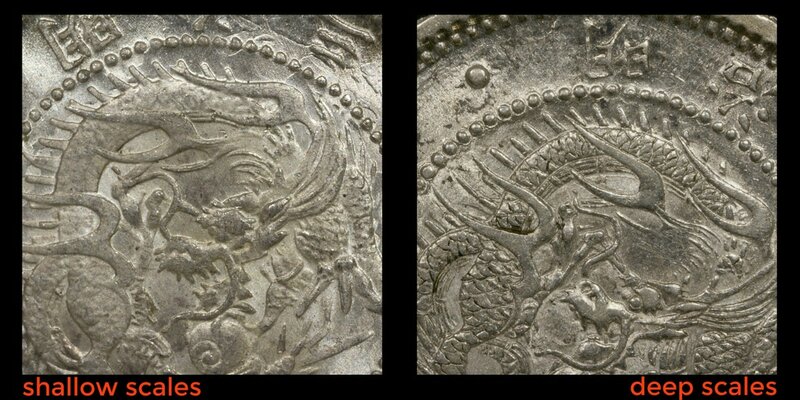 In later years silver was no longer used in the minting process and both the classic dragon and rising sun motifs were abandoned. JNDA 01-23. Shallow and deep scale variants exist, with the deep being the more difficult to obtain. Silver .800 fine. Diameter 17.57 mm. Weight 2.5 grams. Total mintage 6,102,674 without distinction between the types, however the deep scale variety is considerably more difficult to come by. A somewhat toned version of the deep scales. JNDA 01-24. The second design for the 10 sen coin (as with the other silver denominations) retains the dragon obverse but changes the reverse to a large character denomination/crest/wreath design. 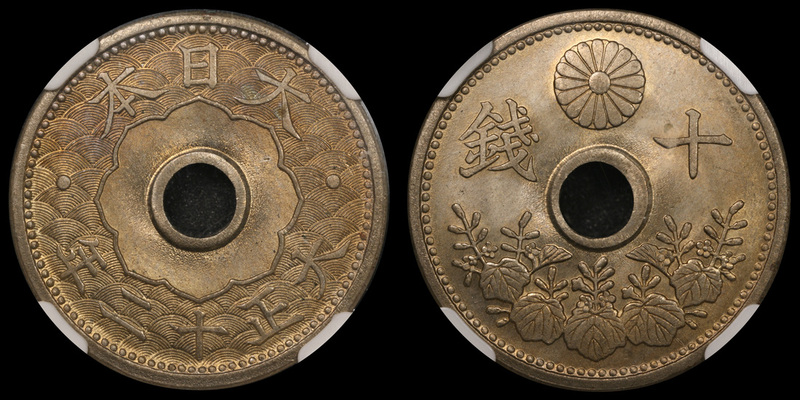 Meiji 20 (1887), NGC MS-67. 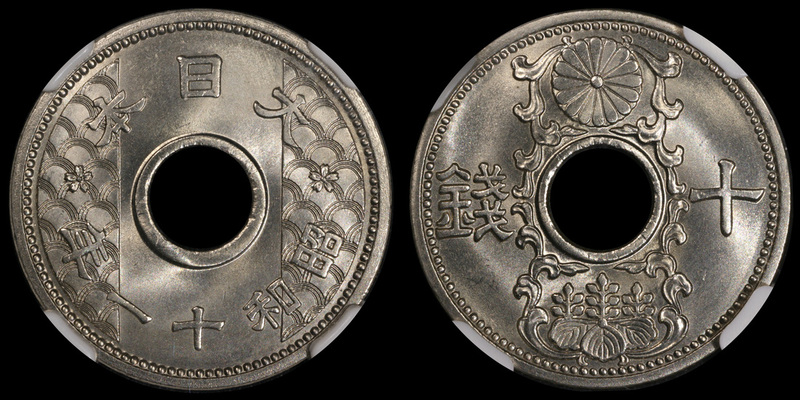 The 10 sen is dated (non-continuously) from Meiji 6 (1873)- Meiji 39 (1906), with several years either skipped, produced only for exhibitions, or otherwise restricted mintages. The slab is a bit scuffed which accounts for the apparent abrasions on the obverse between 5-7 o'clock. JNDA 01-25. The dragon obverse has been replaced with the Rising Sun obverse. The diameter is the same but the weight and fineness have been reduced vs. the dragon style. 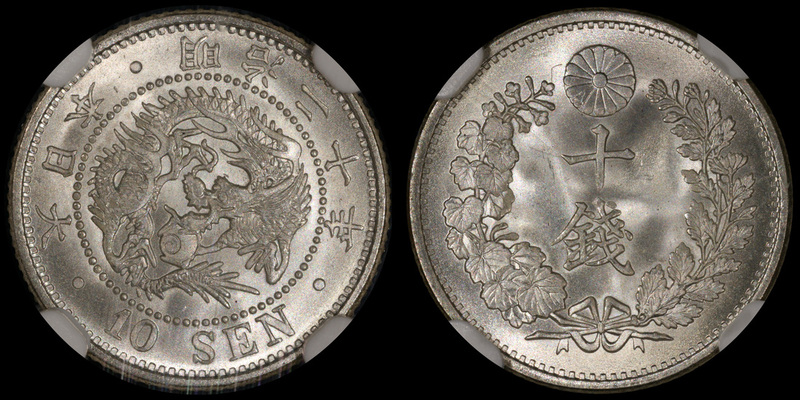 Taisho 6 (1917), NGC MS-67. Minted from Meiji 40 (1907)- Taisho 6 (1917), spanning two eras, this being a Taisho era example. Prominent die polish and the devices are nicely frosty. This year is relatively common in a gem state. JNDA 01-26. Missing from this set, and likely to remain so. 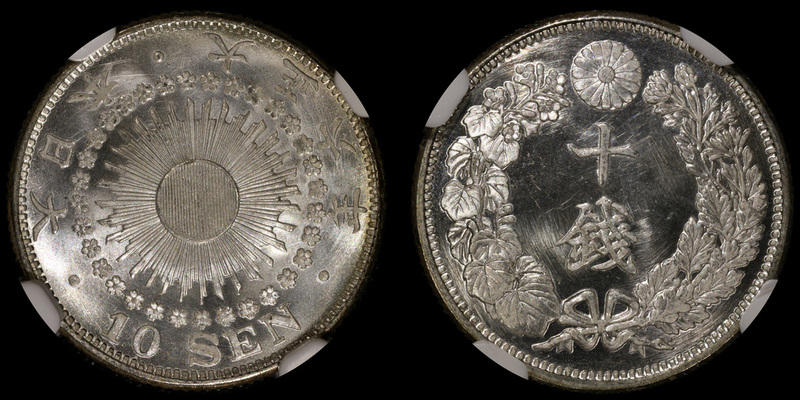 The coin was a two year mintage from Taisho 7 (1918) - Taisho 8 (1919). The design was very similar to the contemporary 50 sen, with a double hoo bird (phoenix) obverse, and a Rising Sun, Sacred Mirror reverse having a crow overlay. It was a tiny, 1.5 gram, silver coin. Total mintage for both years was over 60,000,00, yet the coins are extremely scarce and extremely costly. As yet, I have not seen one for sale. It is included here for completeness, as it does carry a JNDA number. JNDA 01-27. Minted in both the Taisho and Showa eras, the 10 sen has the same design as its contemporary 5 sen. The coin is no longer made of silver, and a center hole has been added. The hole of the obverse is surrounded by the 'Sacred Mirror' emblem, which is one of the Imperial treasures. The phrase 'Dai Nippon' or 'Great Japan' is above the hole, and under the hole is the date. 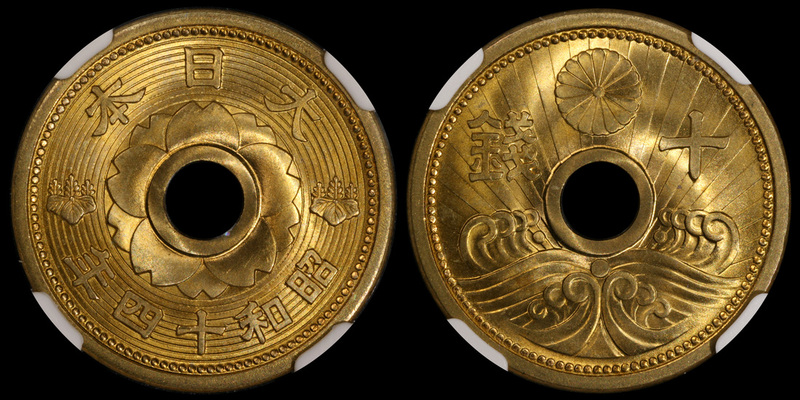 The reverse shows the Chrysanthemum crest (the Imperial Seal) above the hole with the denomination below. Underneath is foliage of the paulownia (the Paulownia represents the government). 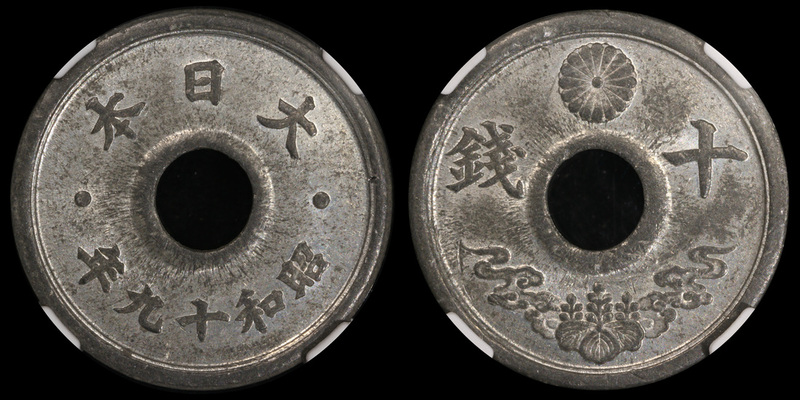 Taisho 12 (1923), NGC MS-67. 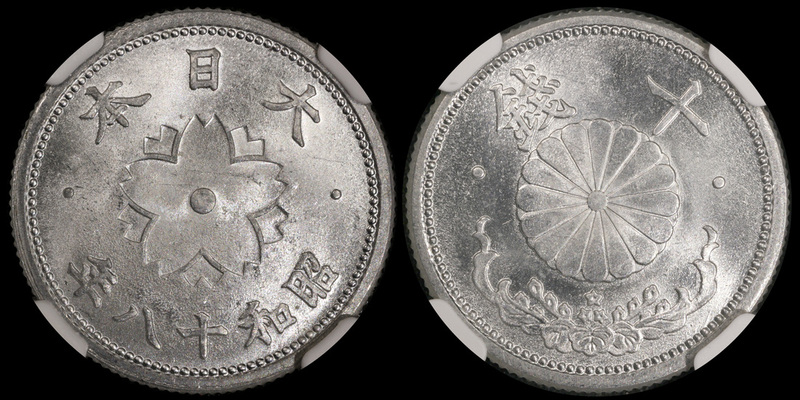 The coin was minted from Taisho 9 (1920) - Showa 7 (1932), non-continuously. Taisho example to the left. Showa 2 (1927), NGC MS-64. JNDA 01-28. A five year issue with the obverse featuring stylized waves along with the issuing authority and date. 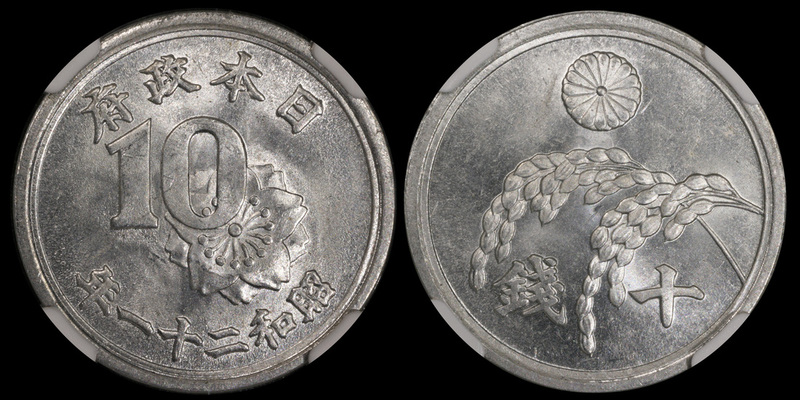 The reverse has the denomination with the chrysanthemum and paulownia symbols representing the Imperial family and the government respectively. Nickel. Diameter 22 mm. Weight 4.02 grams. Showa 11 (1936), NGC MS-67. Minted from Showa 8 (1933) through Showa 12 (1937). JNDA 01-29. A three year series, with yet another change in metal content. The obverse has a double petaled cherry blossom surrounding the center hole and a small paulownia crest on either side. The issuing authority and date are above and below. The reverse has the chrysanthemum crest and denomination over a wave with sun rays as background. Aluminum-bronze. Diameter 22 mm. Weight 4.00 grams. Showa 14 (1939), NGC MS-67. Minted Showa 13 (1938) - Showa 15 (1940). JNDA 01-30. Chrysanthemum blossom on one side, double petaled cherry blossom on the other. Another wartime issue that was minted for three years. Made with aluminum, this coin also went through multiple weight reductions as did the concurrent 5 sen.
Showa 18 (1943), NGC MS-66. The series rarity is the Showa 18 (1943) 1.2 gram specimen. JNDA 01-31. Produced as a single year issue near the end of the war. The design is very simple, the obverse with the issuing authority ('Dai Nippon'/'Great Japan') above the hole and the date below. 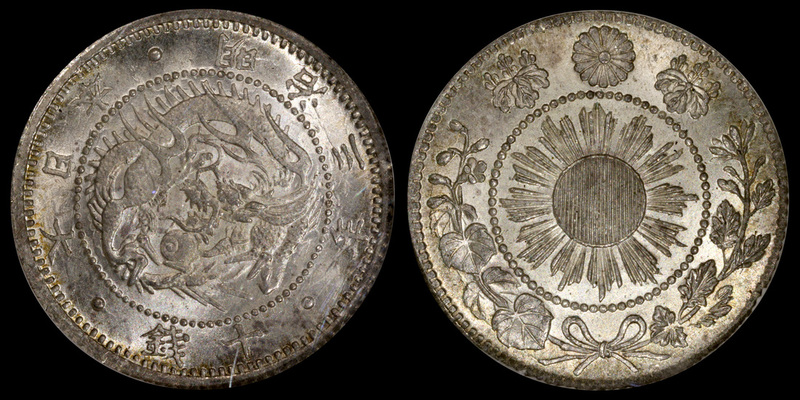 The reverse has the familiar chrysanthemum crest, denomination, and paulownia below. Tin. Diameter 19 mm. Weight 2.4 grams. 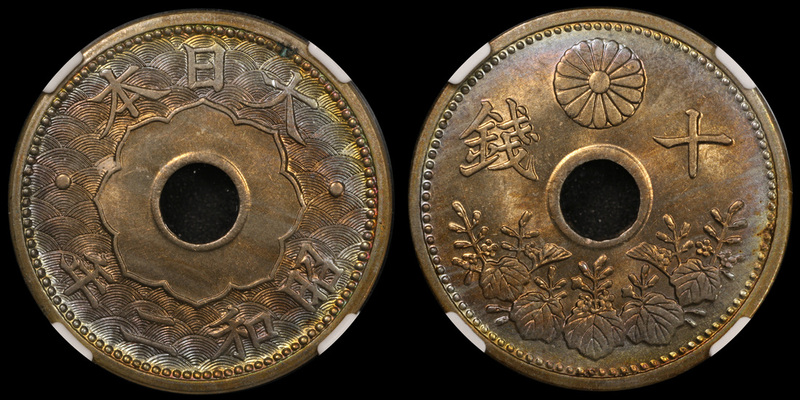 Showa 19 (1944), NGC MS-64. Despite a reported mintage of 450,000,000, the wartime production and reactive metal make finding these in excellent condition difficult. This is the last released 10 sen to fall under the 'Dai Nippon' authority. JNDA 01-32. This is the last 10 sen coin produced. The obverse features an Arabic numeral '10'. Also notable is that above the 10 is the legend 'Nippon Seifu' or 'Government of Japan' (vs. the 'Dai Nippon'/'Great Japan' on the prior issues). This is a short term legend which was used until the new constitution was written and new government formed. Aluminum. Diameter 22 mm. Weight 1.00 grams. Showa 21 (1946), NGC MS-64. Minted Showa 20 (1945) - Showa 21 (1946). ​The legend and date continue to be read right to left despite the Western influence in the production.